The Sixers are prohibitive favorites against the Brooklyn Nets in round one. 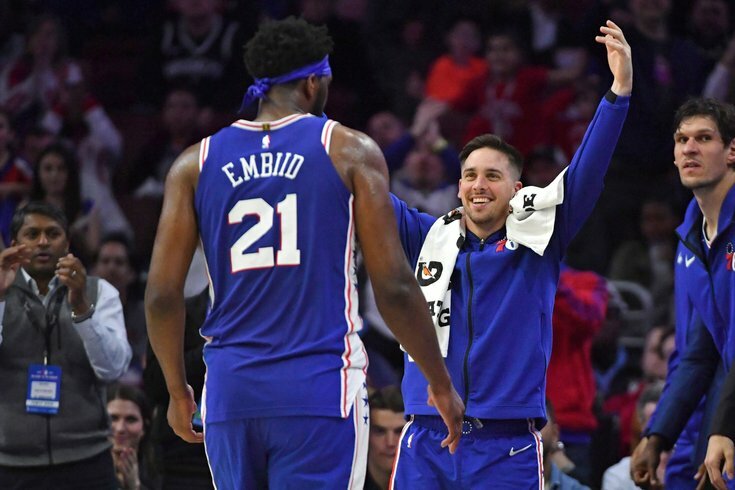 Philadelphia 76ers guard T.J. McConnell (12) greets center Joel Embiid (21) as he comes off the court late in the fourth quarter against the Brooklyn Nets at Wells Fargo Center. All the months of waiting are finally over. The Sixers will open the playoffs against the Brooklyn Nets on Saturday afternoon, and we no longer have to put disclaimers on performances. This is the real deal, the moment the team has been waiting for, and now we get to see whether all the moving and shaking was worth it in the end. Joel Embiid's troublesome knee has thrown a wrench into everyone's prep work for the series, but one thing remains clear: no one is backing down on their predictions or moving their odds too dramatically. The Sixers remain a pretty overwhelming favorite heading into this series, and they should be, Embiid or not. Let's run through how some experts think this series will unfold, whether they set up shop in Philadelphia or the Vegas strip. The overwhelming consensus, from what I gather, seems to be Sixers in five games. A very wise and handsome writer for this website happened to make that pick, so it is obviously the refined choice for basketball experts everywhere. Anyway, let's see what most of the world had to say about this series before Joel Embiid decided to inject some chaos into round one. Rich Hofmann and Derek Bodner, The Athletic — Sixers in five. If the Sixers come out sloppy — a real possibility, given how infrequently many of their star players have played of late — the series could go six games, but it would be a real disappointment from the Sixers’ perspective if the series went beyond that. John Schumann, NBA.com — Sixers in five. The status of Embiid affects everything. In the regular-season series, the Nets outscored the Sixers by 40 points in 58 minutes with Embiid off the floor. If he's healthy, he's the best player in the series and a matchup nightmare for Brooklyn's frontline. Assuming Embiid plays, the Sixers shouldn't have too much trouble getting to the conference semifinals. Well, it's a good thing Embiid is heal—oh, right. Paul Hudrick, Danny Pommells, and Noah Levick, NBC Sports Philadelphia — Paul and Noah have Philly in five, Danny has them in six. The Nets attempt and makes the fifth most three-pointers in the league. Their perimeter shooting is top tier and accentuates a sore spot for the Sixers; great individual perimeter defenders but subpar perimeter defense. It’s strange, I know. I believe the Sixers will win in six games, but it is in their best interest to dispatch of Brooklyn in the least amount of games possible to prepare for the rest of the postseason gauntlet. Jobs and livelihoods are surely on the line for the Sixers. Keith Pompey, Sarah Todd, Marc Narducci, and David Murphy, Philly.com — Split group here again. Keith and Marc have the Sixers in six, Sarah and David have Sixers in five. Perimeter defense and lack of depth have been the Sixers’ biggest weaknesses all season. And it doesn’t help that Joel Embiid’s left knee and the starting lineup’s lack of continuity are concerns. But the starting lineup of Embiid, Ben Simmons, Jimmy Butler, Tobias Harris and JJ Redick is just too dominant to for the Sixers to lose four games to the Nets. This is going to be the first playoff appearance for most of the Nets roster, and the first one for head coach Kenny Atkinson. The Sixers, for all their problems, at least know what it takes to win in the postseason. Even if D’Angelo Russell and Spencer Dinwiddie are going off, I think the Sixers’ core four will come out on top. I expect the Sixers to make easy work of the Nets and make a statement in the opening round to quiet doubters after a dismal end to the regular season. Maybe the Nets sneak in a win. Honestly, my biggest takeaway has to be that I'm one of the only people out here doing previews on his own. Shout out John Schumann. Brooklyn can make Philly sweat, and the Nets feel destined to get a win either by catching fire from deep or seeing the Sixers go ice-cold. This hinges on the health of Joel Embiid, who may not be ready for the opener due to knee soreness. Assuming he's back sooner than later, though, expect him to be a difference-maker; he pounded Brooklyn for 30.0 points and 14.3 rebounds across four regular-season matchups. I won't beat you over the head with any more of those. Pretty much everybody expects Philly to win, and they should, Embiid or not. I'll keep this space updated as we learn more throughout the morning. As of Saturday morning, here's what the sheet looks like for both teams. Joel Embiid (doubtful, left knee soreness) — The big man's availability is THE story heading into Game 1. Some background info for those playing catch-up can be found in our write-up from Friday afternoon. One additional note: during the playoffs, there are additional reports that aren't typical during the season. Embiid remained listed as DOUBTFUL as of Friday night's 8:30 p.m. report. EMBIID UPDATE, 1:20 p.m.: Embiid will be a game-time decision, according to head coach Brett Brown. Brown told reporters Embiid did not do anything at practice after Friday's film session, and that Embiid's pre-game work would largely determine his fate. We saw Embiid go through a relatively extensive pre-game routine when the curtains opened on Saturday afternoon, and the big man was rocking what appeared to be a soft knee brace on his left knee. Beyond that, we'll remain in the dark for a bit. EMBIID UPDATE, 2:20 p.m.: Embiid will suit up and play in Game 1. Jonah Bolden (questionable, left knee soreness) — Bolden was a partial participant in Friday's practice, and if Embiid isn't ready to suit up, perhaps that will give him a little extra motivation to give it a go Saturday. BOLDEN UPDATE: 1:20 p.m.: Bolden will also be a game-time decision for Saturday's game. James Ennis (out, right quad contusion) — Ennis will be reevaluated on Monday, April 15, so he could end up being back a tad sooner than anticipated if the Sixers get some good news for once.